Happy Saturday!!! Time for another movie themed challenge from the Drunken Stampers!! 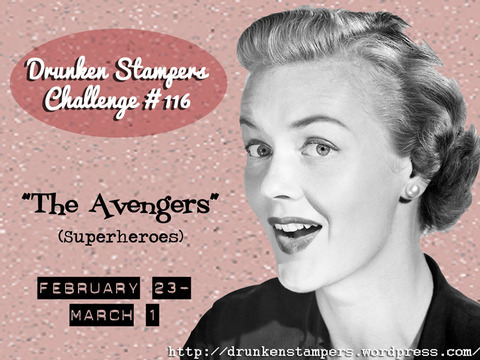 This week the Bahama Mamas are bringing you projects inspired by The Avengers or superheroes. I don't know about you but I love love love the most recent Avengers movie, I love when Hulk gives Loki a pounding and walks away saying "puny god." Yes, I have a warped sense of humour!! Iron Man is my favourite character (yes mostly because I "heart" Robert Downie Jr.), I can't wait for Iron Man 3 to come out!! Be sure to visit the DRUNKEN STAMPERS BLOG for all the details on this challenge and to get links to the Bahama Mamas' blogs...show them some love!! I'm sending a special shout out to the puckster this week for his very kind patience and assistance in helping me out with some digital images for this challenge. This card has double duty, next weekend we will be celebrating a very special little man's first birthday!! So this is going to be his birthday card. When his big brother turned one I made him a Sesame Street card with four characters on it, so I thought this one would be good for little brother! Donna your card ROCKS!!! A twisted easel card? Brilliant! Awesome job! I love this - added texture, a great sketch and interactive. Nicely done!! Love your card, the bottlecaps are beautiful! SO FREAKING COOL! And so very BOY, and perfect for a little boy :) How cool are the bottlecaps?